Pretty frame looks like a flower, comes with an orange plastic dish to put jelly in. Has two scewers to hold half and orange each. About 12 inches long. Pretty black metal holder with a glass dish which is orange. Can be used to hold half an orange or jelly. Made from 90 percent recycled material. 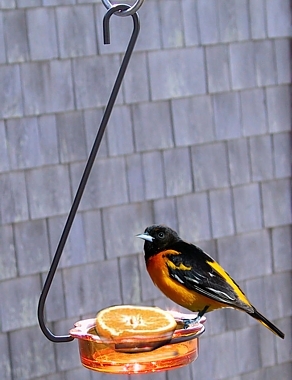 Bright orange to attract Orioles. 2 spikes to poke oranges on. Attached hanging cable. 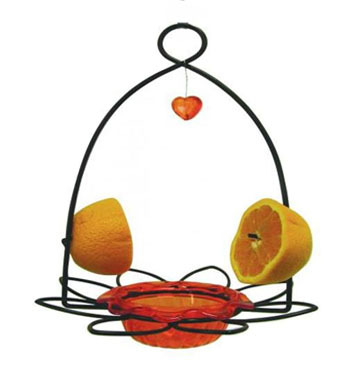 This pretty feeder will hold half an orange or grape jelly. The favorite of Orioles. Black artsy wrought iron hook gracefully balances level to hold the pretty, clear glass blue dish lifts out easily to clean. 12 inches long. 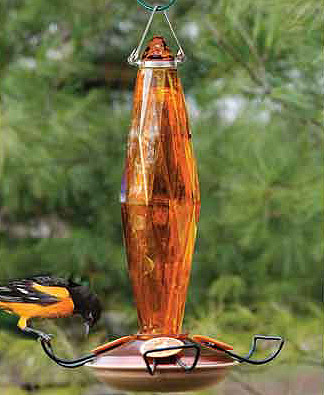 Go green with this super Oriole feeder made from recycled milk jugs. Thirty milk jugs makes one feeder. Heavy duty, will not rot or wear away any time soon. Has two scewers for orange halves and a pretty dish to hold grape jelly. Heavy duty hanger built in. Easy to wash and keep clean. About 12 inches wide. Check out our special Bird Jelly shown below. Orange jewel cut glass holds 8 oz. of nectar. The brushed cooper base has 3 nectar ports. 11 inches long. 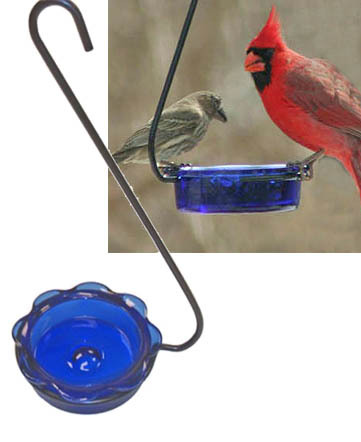 This pretty feeder is made by Wood Link in the USA. Makes a pretty and functional gift. This multi-tasking feeder does it all. You can scewer an orange in the middle or use the built-in ant cup to keep ants out. Just add sugar water, no dye. Has small wells for jelly. Comes apart easily for cleaning. 12 oz. nectar capacity, 8 total feeding stations, 4 built in jelly stations. If you're too lazy to make your own sugar mix, this is for you. This 8 oz. box will mix up 64 oz. of nectar. It mixes instantly with tap water, no boiling required. No artificial sweeteners or color. 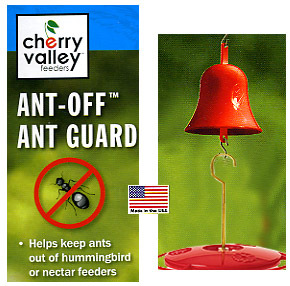 Keep ants off your hummer and oriole feeders with this nifty little ant guard. Shaped like a bell, you simply spread petroleum jelly around the inside and ants won't cross it.  Only needs repeating when necessary, usually once a month. 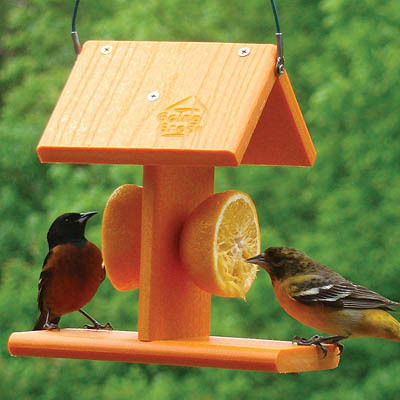 Unlike your fridge, hummer and oriole feeders need to be kept sparkling clean. This little brush helps get into those tough spots. Can bend in various shapes to get at hard to reach corners. Will fit into narrow openings. Bristle end will scrub out any residue. 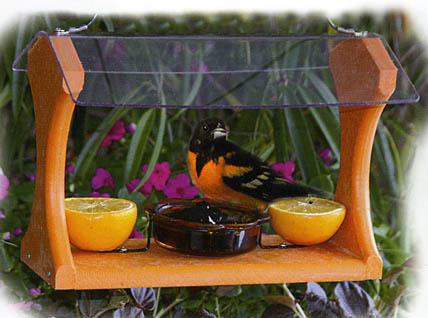 Feeder must be cleaned with every nectar change for the safety and health of the birds. Combine this with the Little Brushes listed below made to clean the small feeding holes and ports. 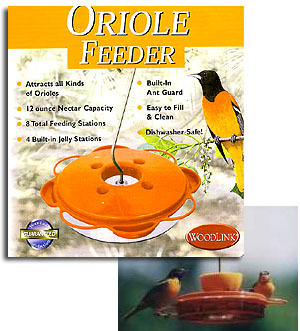 For hummer and oriole feeders. 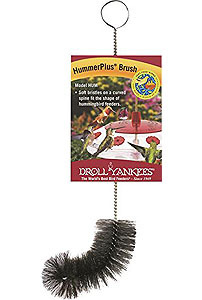 Perfect for scrubbing out those little holes in hummingbird and oriole feeders, which can get really gunked up if you do not. (They really work great for cleaning the holes in travel coffee lids too.) Handy pack of 3. * If you mix your own food the ratio is 1 part sugar to 4 parts water, do not use any coloring. Food coloring may be harmful to the birds. 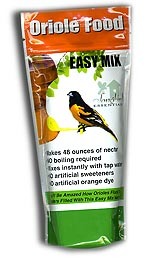 * Wash feeder well and replace nectar every 3 or 4 days whether used by the birds or not - it will turn black and icky. This means you cannot put a new feeder out, waiting for the first orioles, and just leave it. * Just stick out half and orange until you are sure your orioles are back and then put out nectar. * If using jelly, just put out a little at a time, too much may get on the birds.